Over the weekend, a controversial tweet made by Nana Appiah Mensah went viral. 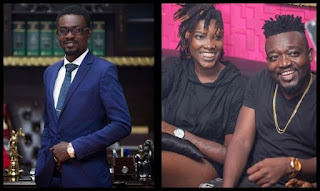 In the tweet, the Zylofon Media CEO, Nana Appiah Mensah talked about reaching an agreement with the late Ebony Reigns and Ebony begging him to bail her out by paying off Bullet, her manager. Social media was divided over the tweet with some arguing that his tweet was inappropriate and insensitive. Well, in an interview with Sammy Flex on Showbiz Agenda aired on Accra Based Zylofon FM, Nana Appiah Mensah has explained his tweet. According to the CEO, the tweet was just a tribute expressing how he feels about the death of the singer. He added that the tweet expressed how he knew Ebony before she died and he couldn’t wait for a week before mourning her passing as people are accusing him of bad timing. Explaining the “Bail Out” comment, Nana Appiah Mensah stated that, Ebony requested he pays off a clause in her contract which amounted to $100,000 and probably more before she could join a different label. Touching on the “Let’s Pay Critical Attention To Our Female Artist” comment in the tweet, NAM as Nana Appiah Mensah is affectionately called explained that women are weaker vessels as the bible says so they need special attention more than the men, hence that comment and means no disrespect to Bullet. He, however, added that Ebony called for the meeting and he met Ebony and the same team she died with (Francisca Yaa Nkansah and Lance Corporal Francis Atsu Vondee) with Bola Ray and one Frederick over a launch meeting. In conclusion, Nana Appiah Mensah stated that he is not beyond criticisms as being stated by some people on social media but the verbal insults are needless and unacceptable.